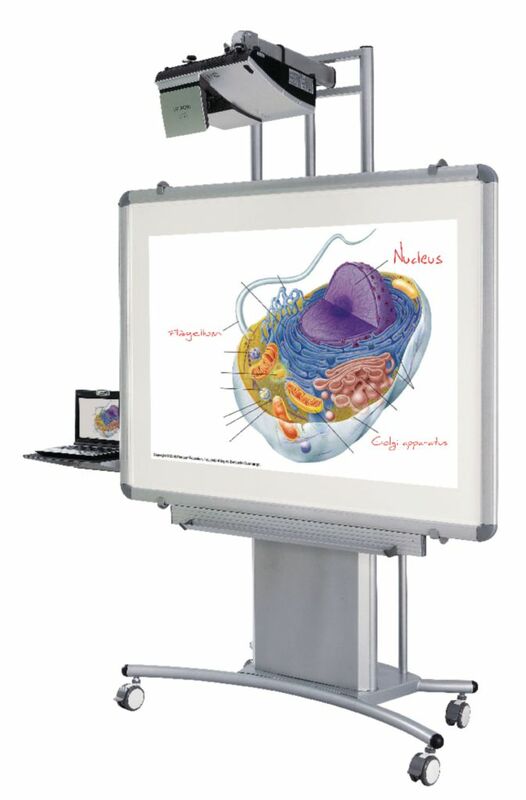 Instantly transform virtually any interactive whiteboard toa mobile and height adjustable unit. This durable stand is made of steel with a matte silver powder coat finish. Its electric system features smooth operation and 20" of height adjustability, allowing the board to be set anywhere from 12" at the bottom to 84"at the top. Stand holds boards up to 2" thick and is boom stability tested up to 50lbs. at full extension. The universal projector boom fits all popular short throw projectors. The optional sidewing table is perfect for laptop computers and measures 17 3/4"W x 12 5/8"D. The optional 3-outlet electrical assembly has a 25' cord and mounts to the back of the unit. Size: 82"–102"H x 55"W x 27 1/2"D. Weight 294 lbs. Stand ships direct from the manufacturer in two cartons.